(CNN) - A former four-term Democratic congressman from Alabama and one time strong supporter of President Barack Obama will campaign for Mitt Romney Wednesday. A Romney campaign aide confirms to CNN that Artur Davis will stump for the presumptive Republican presidential nominee in the battleground state of Virginia. 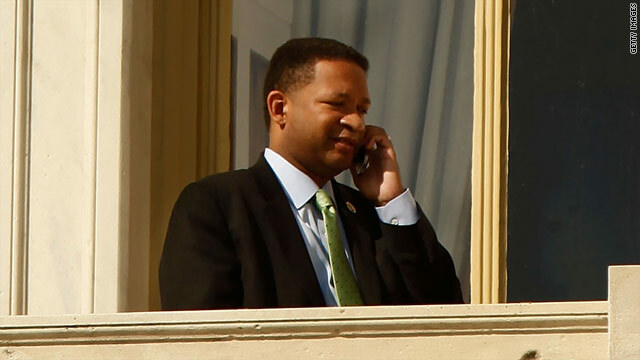 Artur Davis appears Wednesday on CNN's "The Situation Room with Wolf Blitzer." Watch the program from 4 p.m. ET – 7 p.m. ET. In 2010, Davis made an unsuccessful bid for governor of Alabama. In May he announced he was switching to the GOP, leaving the door open to a future political bid as a Republican. Davis said in June that he thinks his one time political party was becoming more unwelcoming towards Southern conservative Democrats. "I think the Obama administration has candidly gone too far to the left. You can raise all kinds of questions on whether that's good politics or not," Davis said on CNN's "The Situation Room with Wolf Blitzer." "Obviously the election will determine that." The Romney campaign says Davis will team up with Virginia GOP Victory Chairman Pete Snyder and a local business owner at an event in Arlington. Buzz Feed was first to report on the Davis appearance at the Romney campaign event. The big pay off. He sold his soul for the almighty dollar . . . "Money, money, money" Next. Davis is absolutely correct to believe that Republicans will improve race relations. They have a proud history in this realm – most recently with Bachmann’s latest fear mongering. Congressman Davis should be ashamed of his comments considering his pedigrees. I wonder if he is been following developments at home here with the super Pac contributions and negatives attack on both sides.Good luck in your desperate ambition. One thing I do know is that Americans are not stupid. The tea party has taken the republicans so far to the right that being in the center looks extremely left. My question is: what was he promised to do this? If he had ANY integrity, he would say no and work to represent his constituents, regardless of party affiliation. This man has been bought and paid for by either the Koch brothers, or Adelson. If I were an Alabamaian, I`d be concerned to have Davis in any position of leadership. He is a self serving politician 1st and foremost at a time where America needs people who are smart and honest. There is no way, given the Republican`s undermining of this President, as revealed in FEBRUARY of 2009 by Mitch McConnel`s plotting [which was caught on camera] , any honorable persom would blame the President And I for one wonlt reward them for their obstruction. He sounds like sour grapes. He figured Pres O would nominate him for Secy of State or some other high position. Romney is promising him the moon now, too and when Romney loses, Davis' career will be what the mailman stepped in. What a traitor. Americans don't like traitors and Arthur Davis will be treated like that. I am sure the Republicans promished him millions to join their team. Let's give millionaires and billionaires more tax cuts and punish the middle class. Now heres a guy with a pair, good for you sir, stand up for your beliefs!!!!! How can Davis be so foolish, and may I daresay, ignorant, as to think the the republicans will do a better job with race relations than President Obama?! The man is obviously delusional!!! Democrats should bid him GOOD RIDDANCE ! Awe he found one person of color to tout lies for his campaign. It won't work. This man is being used just like Michael Steele to try and get minorities into the republican fold. Too late, we see your true colors. Also Biden should not apologize for anything. What is good for the republicans is also good for the democrats, the difference is the republicans are cowards when it gets to hot for them. Davis is a traitor. If Democrats moved more to the left; will you make Romney & Repubs move more to the center from the extreme right they are sitting at? It's all about where you can be given a political position as a poster child for the black. That's how some people turn their backs to those that helped them. You will soon find out you are loosing your integrity if you ever had one. Proof that people will sell their souls for the mighty dollar. Obama too far left? The left complains he's too far right for them, are you serious? Again, I'm sure money had a little to do with this one.